Researchers have found that only about 20% of how you age is genetic1. Whatever your age, don’t let sun damage and passing years dictate the tone and texture of your skin. Take control of your skin with an Elite® laser facial skin treatment. With an Elite treatment, you can experience a noticeable improvement in fine lines, wrinkles, and overall skin appearance. The Elite laser works by using pulses of light that target unwanted discolorations in the skin, reducing or eliminating their appearance. Age spots, sun spots, freckles, wrinkles, even facial veins and the blush of rosacea can all be treated effectively. Additionally, a laser facial is known to have the benefit of gently heating surrounding tissue, resulting in collagen stimulation2, which improves your skin’s texture and provides a fresher, smoother look to your skin. Contact Shanti Laser Centre to find out how we can help you take control of your skin. 1. Barzilai N, Guarente L, Kirkwood TB, Partridge L, Rando TA, Slagboom PE. The place of genetics in ageing research. Nature Reviews: Genetics. 2012 Jul10; 13(8):589-94. 2. Schmults C, Phelps R, Goldberg D, Nonablative facial remodeling: Erythema reduction and histologic evidence of new collagen formation using a 300-microsecond 1064nm Nd:YAG laser. Arch Dermatol. 2004; 140:1373-1376. 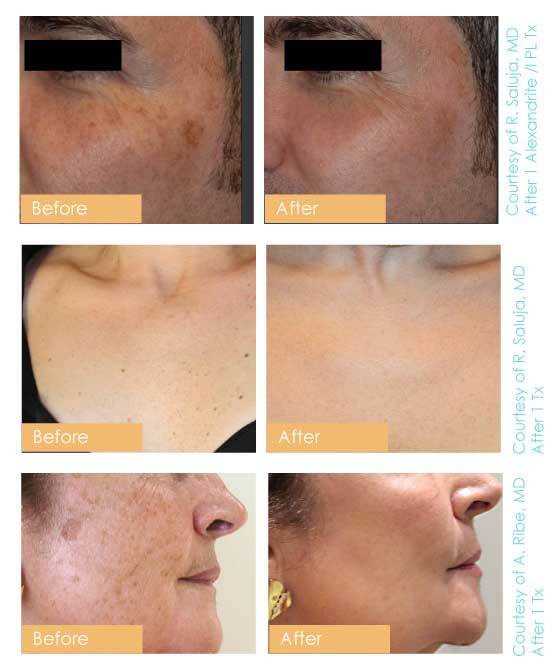 A laser facial skin treatment works by using light to target unwanted discolorations in your skin, including freckles, sun spots, age spots, enlarged blood vessels, and the blush of rosacea, reducing or eliminating their appearance. This treatment technology is known to have the added benefit of gently heating surrounding tissue, resulting in collagen stimulation2, which improves your skin's texture and wrinkles a fresher, smoother look. Unlike other treatments that actually remove an outer layer of skin and require significant healing time, a laser facial works by targeting the underlying pigments and vessels that you wish to eliminate. To achieve optimal benefits, patients typically have multiple treatments, scheduled 3-4 weeks apart. Treatment sessions usually last about 15-20 minutes. How do I schedule an appointment for the facial skin program? To schedule a consultation, simply call 780-352-0945 and our representatives will help you with your needs.